TBT: The Parliaments, "(I Just Wanna) Testify." I seem to be stuck in my law school years in these TBTs so far, but heck, this was the whole "Summer of Love" to Woodstock era. 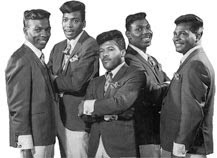 The Parliaments (photo) were George Clinton's pre-Parliament/Funkadelic group. This gospel-rooted number sent chills down my spine when I heard it on Boston's WRKO in the fall of 1967.